“After a lot of work behind the scenes, those 15 persons are now out of the state’s accommodation and in possession of their travel documents once again,” Red Thread said in an update to participants at a recent Walter Rodney commemorative event held on June 13, 2017 when the status of the Haitians was raised. Demerara Waves Online News was told that the 16 have been granted tourist visas, allowing them to remain in Guyana legally until September, 2017. Sources said during that period steps would be taken to find them sponsors to have them gainfully employed and granted work permits. 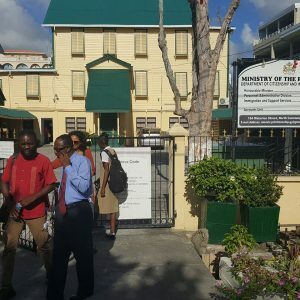 Earlier this month, Guyana sent back eight adults and six children to Haiti, saying that police had suspected that efforts had been made to smuggle them through Guyana to other destinations. Items requested include toiletries – soap, toothpaste, toilet paper, sanitary pads, lotion etc- as well as housing and household stuff- beds/mattresses, table, chairs, stove and gas cylinder, pots/pans, wash basins, utensils, bedding, curtains, household cleansers, brooms, buckets, sewing machines, and farming implements such as cutlasses and forks. Donations can be dropped off at Red Thread, 72 Princes & Adelaide Streets, Charlestown, Georgetown. Food items being requested include rice, red and black beans, coffee, bread, salted and sweet biscuits, meat, eggs, fish, coconut milk, bananas, oranges, mangoes, melon, potatoes, pasta, ketchup, tomato paste, cheese, vegetables, cooking oil, salt, and sugar. Red Thread also called on Guyanese to assist the Haitians with casual wear clothing and work gear for the men as as well as footwear fir the women and children. The rights organisation also asked for school supplies and urged private primary schools to grant full scholarships to the seven children and the 16 year old who may be able to pursue some computer courses.